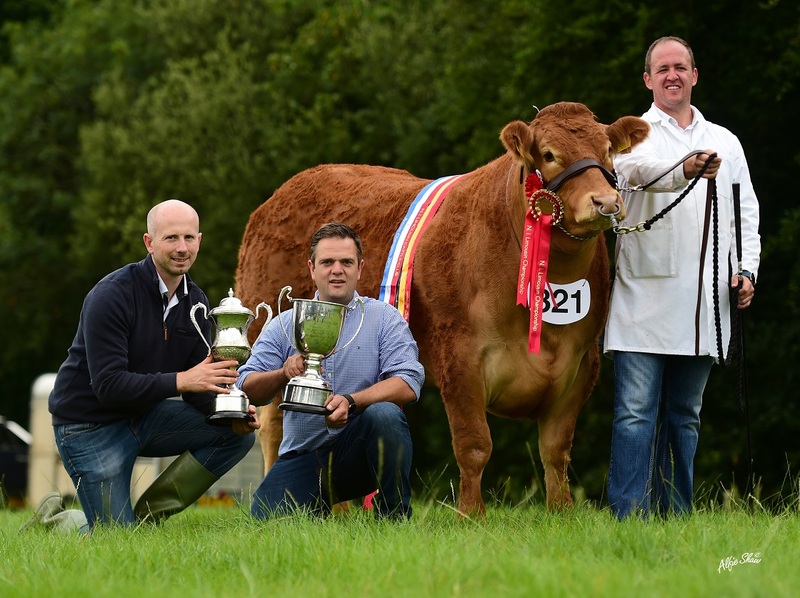 The annual Northern Ireland Limousin Championship was held on Saturday 28 July 2018 at the Randox Antrim Show in the beautiful setting of Shanes Castle Estate, Antrim. 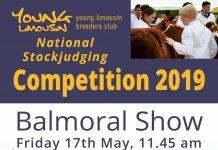 This year the Limousin judging was in the very capable hands of Ian Callion from the renowned Lodge herd based in Stirling, Scotland. Local breeders and show spectators looked on as the judging got underway at 9.30am, fortunately, the heavy downpours, which had been forecast, held off until the afternoon. The Female Champion, Senior Champion and Overall Limouisn Champion was Deerpark Maisie bred by Connor and Ryan Mulholland, Craigavon, Co Armagh. This July 2016 born heifer is by Ampertaine Elgin and out of the dam Bernish Icequeen. 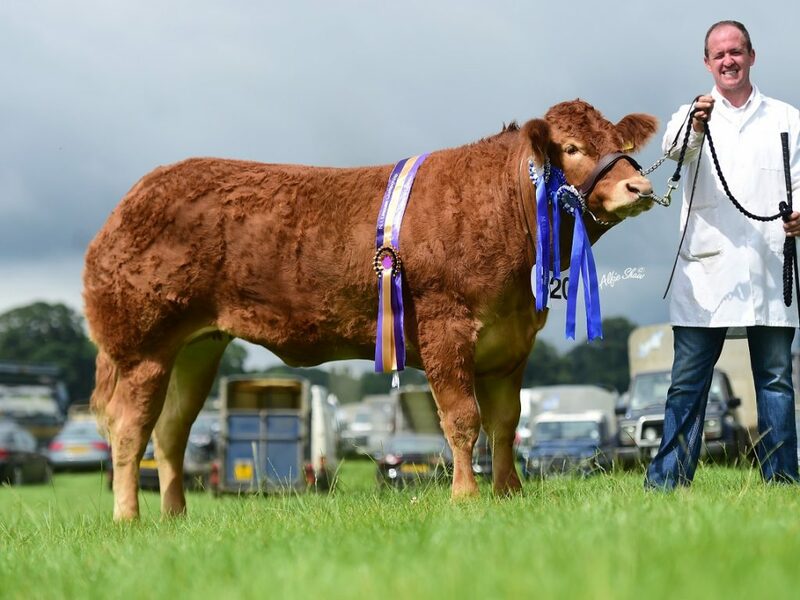 On the day Maisie was also awarded the Clyde Perpetual Challenge Cup, by the Antrim Agricultural Show Society, for the Overall Champion Limousin and the Bridgeford Saskia Perpetual Trophy, by the Northern Irish Limousin Cattle Club, for Female Champion. Maisie stood third in her class at the Balmoral Show earlier this year. 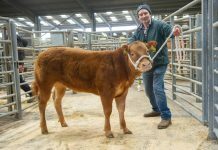 She went onto be tapped out as the Reserve Supreme Beef Champion in the Interbreed Championship when she came before Judge Peter Henshall, Lockerbie. No stranger to success at the Antrim Show, she won the Junior Championship at last year’s event. 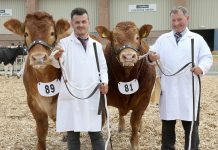 Making it a highly successful day for Connor and Ryan, Reserve Supreme Limousin Champion, Reserve Female Champion and Reserve Senior Champion went to Deerpark Missmoneypenny. A two year old Ampertaine Gigolo daughter, out of the dam Ampertaine Isadora, Missmoneypenny stood as Reserve Junior Champion to her stablemate Masie in 2017. 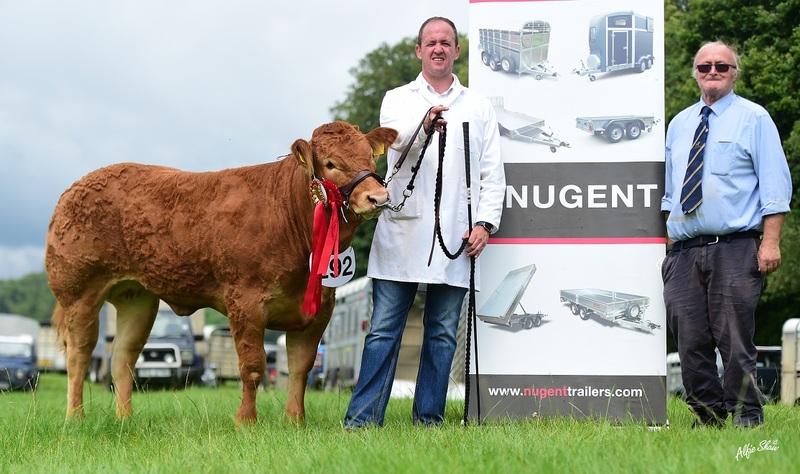 Male Champion and winner of the Derriaghy Perpetual Trophy, awarded by the Northern Irish Limousin Cattle Club, was Gunnerfleet Mack from the Crawford Brothers of Maguiresbridge, Co Fermanagh. 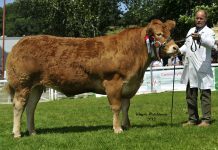 Bred by Mr Ian Handley at Gunnerfleet Farm, Ingleton, Lancashire, the March 2016 born bull is sired by Plumtree Fantastic and out of Gunnerfleet Isabella. Mack stood first in his class at the Balmoral Show in May. 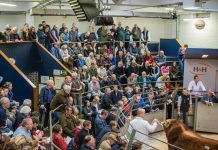 He was purchased by the Crawford Brothers at Carlisle in October 2017 for 5,250gns. 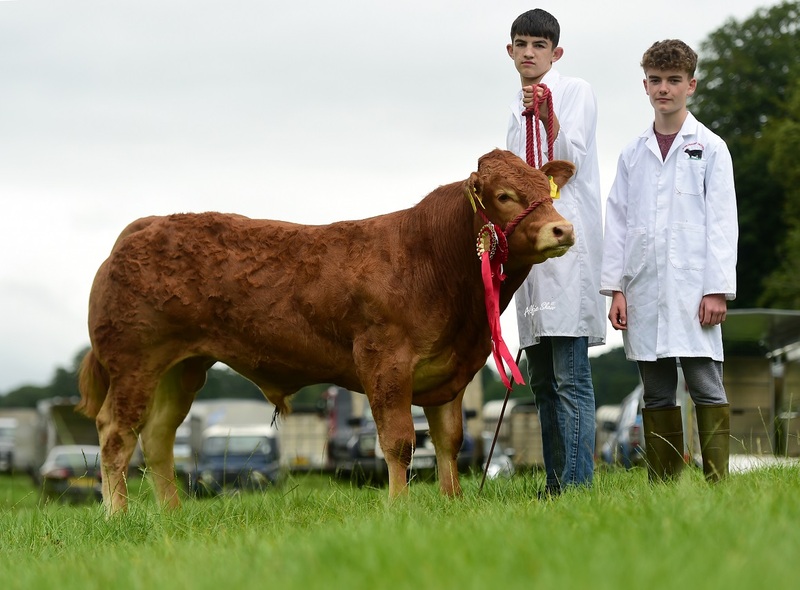 Reserve Male Champion, Intermediate Champion and then the winner of the Interbreed Beef Bull Stakes, was Larkhill Nuludo home-bred by Brian and Cahir McAuley, Antrim. This June 2017 born bull is sired by Ludo and out of the home-bred dam Larkhill Ita. Nuludo stood third in his class at this year’s Balmoral Show. Reserve Intermediate Champion was Pointhouse Nintynine bred by Michael and Kile Diamond, Garvagh. This June 2017 born bull is another sired by Plumtree Fantastic, this time out of the dam Ampertaine Ingrid. Nintynine stood second in his class at the Balmoral Show. 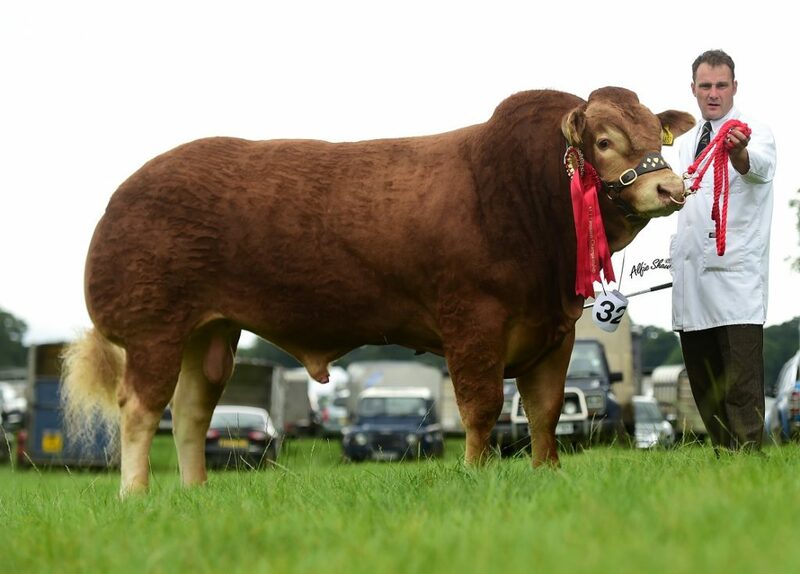 He went onto lift the Junior Bull Interbreed Championship and took Reserve in the Interbreed Beef Bull Stakes. Junior Champion, Deerpark Niceone, was another heifer from Connor and Ryan Mulholland. This August 2017 born female is by Lodge Hamlet and out of the dam Bernish Icequeen. Reserve Junior Champion was Coolderry Nannyberry from Leslie Millen, Coleraine. Born November 2017 she is by Wilodge Goldcard and out of the dam Bambrook Jill. Calf Champion was Clanart Officer home-bred by John Murphy, Brookeborough. This January 2018 born bull calf is sired by Netherall Jackpot and is out of the dam Clanart Helene. Reserve Calf Champion was Pointhouse Olivia from Michael and Kile Diamond. Olivia is an April 2018 born daughter of Ampertaine Gigolo and out of the dam Pointhouse Fern. 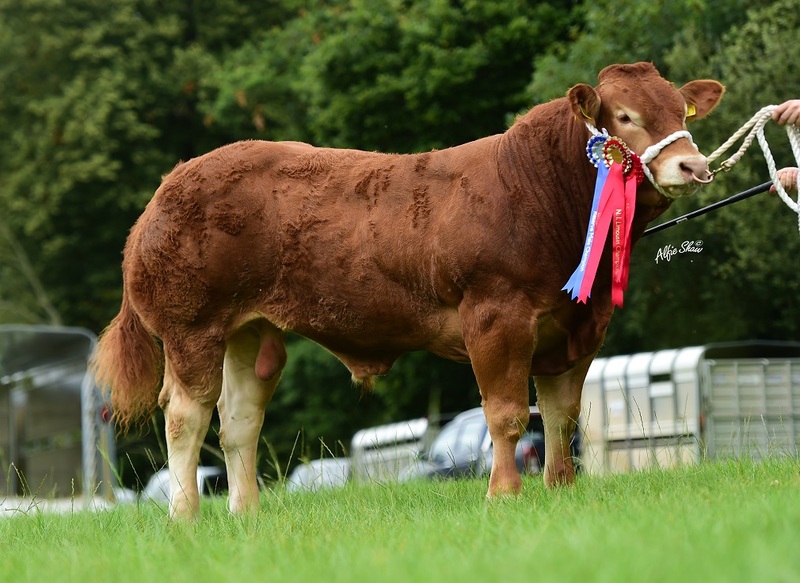 The Interbreed Beef Pairs contest was a clean sweep for the breed, with the Mullholland team taking the red rosette with Masie and Missmonepenny, ahead of a duo from James Alexander, Randalstown, Co Antrim, in the shape of Jalex Notorious and Jalex Nini. 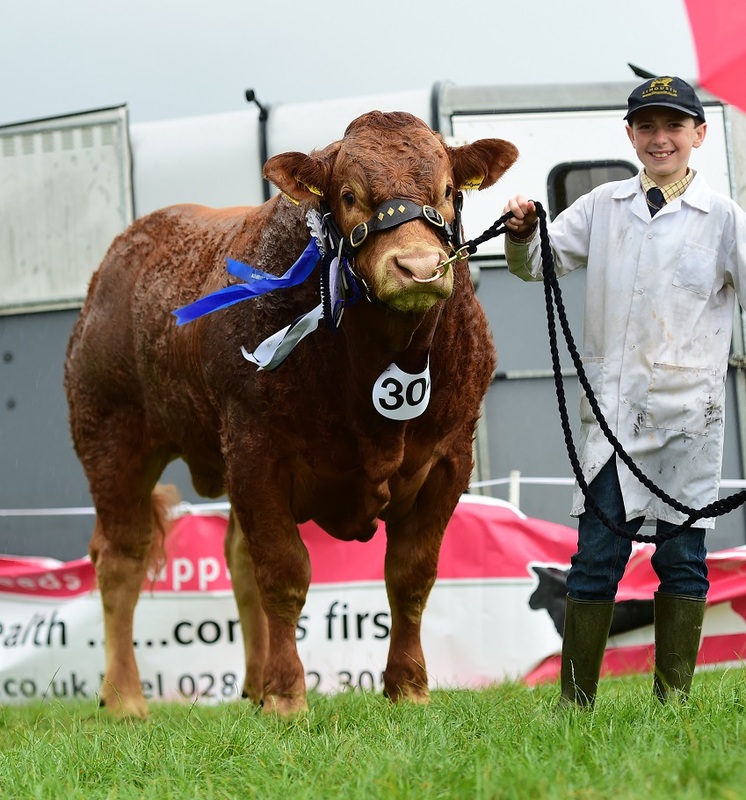 The February 2017 born home-bred young bull Notorious, by Bassingfield Hobama out of Haltcliffe Hester took the Junior Male Championship and then the Overall Male Championship at the Balmoral Show in May. 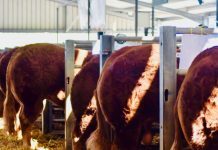 Similarly, paired with Nini, who is a smart 14-month old heifer also by Bassingfield Hobama but this time out of the Ampertaine Cannon daughter Hudscales Gigi, they were victorious in the Exhibitor Bred Limousin Pairs Championship at Balmoral as well. Tapped out as third in Antrim was a home-bred pair from Robert Clyde of Templepatrick in the shape of Clydevalley Mains and Clydevally Nancy. 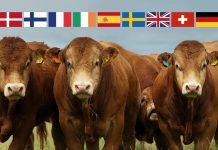 The Commercial Championship, for heifers and steers sired by a Limousin bull, took place after the Limousin pedigree judging. Taking the red rosette for the Overall Commercial Champion was Candy Floss from JCB Commercials, Newtownards, an Elite Icecream daughter. Making it a one-two for JCB Commercials, their heifer Sporty Spice, a Norman Ely daughter was tapped out as Reserve. 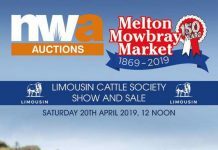 The Northern Irish Limousin Cattle Club would like to thank all those who entered for this Championship and their sponsors for their continued financial support at this annual event; A I Services (N.I.) 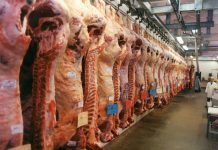 Ltd, Greenmount Country Stores, Andrew Hyde Feeds, J A McClelland and Sons, Nugent Engineering and the British Limousin Cattle Society. Thanks also go to the hosts Randox Antrim Show and to the Judge Ian Callion.